Microsoft is doing a great job of embracing open source, cross-platform technologies. Just look at the release of Visual Studio 2015, we’ve got first class support for python, node, android, iOS, cordova, the list is endless. The days of using Microsoft developer tools to develop code that only runs on Windows servers is over. 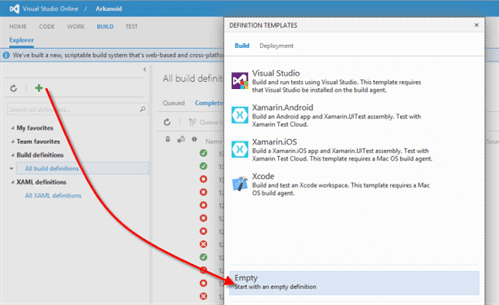 More than that, updates to Visual Studio Online made over the last few years, starting with support for GIT and now the new cross-platform build system, have finally made the Visual Studio Online platform a real choice for non-Microsoft developers. Don’t believe me? Well let me walk through an example how you can use Microsoft tools to create the full development infrastructure, from source control to build, test, deployment and hosting, to support a node.js project (or any other non-Microsoft language actually) without ever coming across, using or interacting with a Windows Server or Windows operating system. First things first, I log into my Ubuntu desktop and create a Visual Studio Online account. For those that don’t know, Visual Studio Online is the cloud offering of TFS. The first thing I can do once I’ve created my account is to create a new team project and select GIT as the version control system. That’s it, I’ve got complete GIT hosting now. Did you know VSO offers free unlimited private GIT repositories? That’s in stark comparison to GitHub who don’t offer any free private repos. Now it’s time to start developing your codebase. I’m going to download Visual Studio Code, which is a free code editor from Microsoft. Visual Studio Code supports GIT integration, intellisense and debugging of an ever expanding set of languages and wait for it…it runs on Linux and Mac OSX. I can start writing my code and start committing and pushing changes into Visual Studio Online. I’m using the arkanoid game I wrote as an example. We can also debug the node code direct from Visual Studio code and we get intellisense on node modules. You’ll notice at this point that we have been using exclusively Microsoft tools and not once have we had to leave our Ubuntu desktop, and we could have done exactly the same on Mac OSX, pretty sweet. Visual Studio Online gives us way more than just a source repository. We can also use it to create and manage our development backlog. VSO supports Scrum, Agile and CMMI out of the box and support for customised processes will happen during 2015. 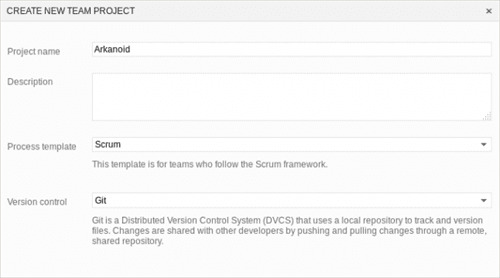 You link backlog items to GIT commits and you also get team rooms, scrum and kanban boards. Finally we need an automated build system. Ideally we would like to automate testing, packaging and deployment of our codebase and we can do that using VSO’s new build system. I’ve written a lot about the VSO’s new build system, put simply, it is a web based, cross platform and fully extensible build system. If you queue this build you should see the build agent clone the source onto the build server which is a good start. Let’s add some more build actions, I’m going at add two tasks, one to run NPM install and one gulp task. If you haven’t used gulp yet then check out this nice tutorial. Put simply, we need to install gulp and any gulp tasks we will be using, create a gulpfile.js file and code all our actions in this file. So, create a gulpfile.js somewhere in your source repo. 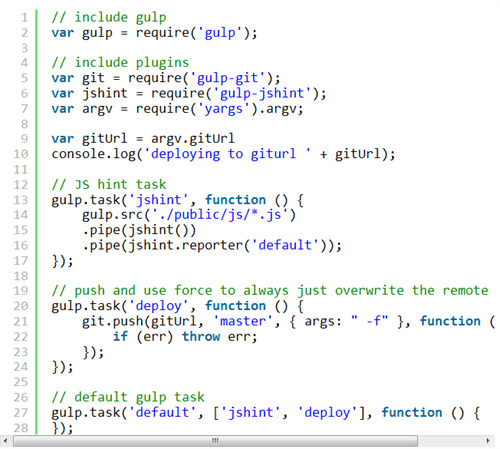 The first lines load up all the gulp components using require, then we simply run the jshint task and the deploy task. We can easily add many more tasks to the gulp script such as minifying files or stripping out debug statements. Running build we will see all tasks running, our gitUrl passed in and parsed and the site deployed to Azure. There it is. End to end development, testing, versioning and deployment of our node app all from within Visual Studio Online.